The whole time I was in elementary school, we ducked and covered. The siren went off — whoooo — and we cowered under our desks for a minute or two and thought about death. This went on, month, by month, by month – when I was six years old, seven, up until I was about eleven – we were told and we acted it out with our little bodies – made the terror incarnate – that the Soviet Union had nuclear missiles pointed right at us –- right at Feasterville, Pennsylvania! – and when they used them –- which those evil communists were sure to do –- this just might save our lives. Or not. It was very, very real. Not just the end of the world as we knew it –- but the end of the world. Period. The destruction of the planet. It’s significant that this forum is being held on this particular date. Exactly 50 years ago yesterday, the 13-day-long Cuban missile crisis ended. That was probably the closest we ever came to blowing up the planet. Tomorrow is the 60th anniversary of the day the US detonated the first hydrogen bomb at Eniwetok Atoll on the Marshall Islands. 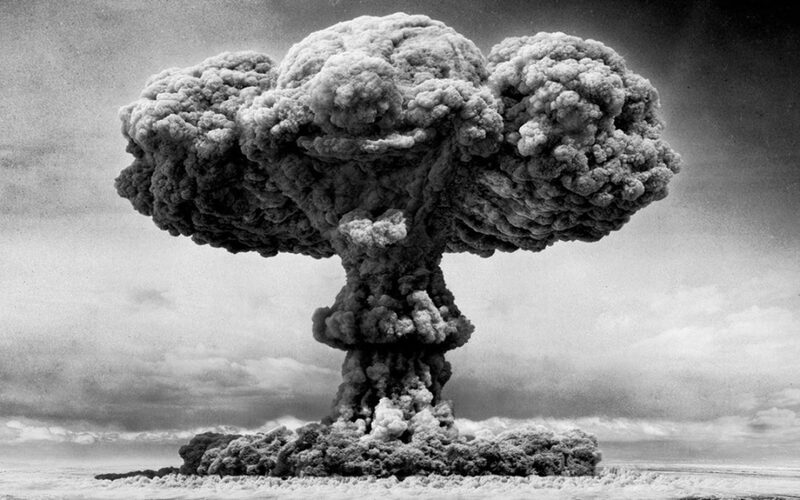 Code named Ivy Mike, it was 10.4 megatons – in comparison, the bomb dropped on Hiroshima was about 16 kilotons. Ivy Mike vaporized the islet of Elugelab. B-17 Flying Fortress drones flew through the radioactive cloud to test atmospheric samples. Remember that word – drones. We’ll revisit it. Another thing they asked us to do when we were in elementary school was to donate our baby teeth for scientific testing, to see if they contained strontium-90, a cancer-causing radioactive isotope released by nuclear testing. Ultimately, the study showed that children born after 1963 had levels of strontium 90 in their baby teeth that was 50 times higher than that found in children born before the advent of large-scale atomic testing. The findings helped convince U.S. President John F. Kennedy to sign the Partial Nuclear Test Ban Treaty with the UK and Soviet Union, which ended the above-ground nuclear weapons testing that placed the greatest amounts of nuclear fallout into the atmosphere – and into my teeth. The power of unleashed technology to end the world as we know it is not a new concept. One of my favorite authors is Mark Twain – I am always surprised at how contemporary and relevant his writing still is. One of the strongest fictional cases Twain made against war was in his time travel novel, “A Connecticut Yankee in King Arthur’s Court,” written in 1889. The hero, an arms manufacturer named Hank Morgan, is hit on the head with a crowbar and transported to the sixth century of Medieval England – the time of Camelot, of King Arthur and the Knights of the Round Table. Because of his his knowledge of modern technology Morgan is running the country within a matter of months. Eventually the people rebel, and he decides to fight. He pits his army of only 54 supporters against an army of twenty-five THOUSAND English knights. “We will kill them all,” he brags. And he does. The first wave of knights hit a perimeter of buried “glass-cylinder dynamite torpedoes.” and are “reduced to homogeneous protoplasm,” Twain writes. Then, eleven thousand knights are instantly killed when Morgan runs a current through a series of thirteen electrified fences. Finally the thirteen Gatling guns “vomit death,” as Twain puts it, upon the remaining ten thousand knights. Morgan won – or did he? Morgan’s 54 victors are “enclosed with a solid wall of the dead – a bulwark, a breastwork of corpses.” The air becomes poisoned with putrid death gasses and everyone – except Morgan – becomes sick and dies. The point is – they ALL died. Not just the conquered enemy, but also the victors. There are no winners. We invent a bomb, drop a bomb, test a bomb – and sure, the enemy will die, but it is OUR children who end up with Strontium 90 in their little bodies. Remember this story – we’ll come back to it. So far, I’ve taken us all over the time and space continuum – from the the time of King Arthur into the 1950s. But what’s going on today? What do YOU have to deal with? I’d like to concentrate on just one thing – drones. Drones: – more properly, unmanned aerial vehicles, or UAVs – are aircraft that are controlled remotely. They may be flying over Pakistan, where we are using them extensively, but the joystick is being twiddled by someone staring at a video screen in an airbase in Nevada. Many are just surveillance drones – with cameras that broadcast back to headquarters – but others carry bombs – typically, Hellfire missiles. Eleven years ago, at the start of the wars in Iraq and Afghanistan, the US had fewer than 50 drones. Now, we have 7,500. Some are under the control of the military, some owned and operated by the CIA and used to “target” – that means assassinate – suspected militants in Pakistan and Yemen. This sounds like a GREAT idea, doesn’t it? It seems to make perfect common sense to be able to achieve our tactical military objectives without any danger to our men and women in uniform. So am I celebrating the end of armed conflict as we know it – doing a little happy dance up here? The report also describes a practice of a second strike on the same target – just to make sure we got ’em — which often kills the first responders – EMS, firemen, police — or families converging to gather up their dead for burial. Many targets are now identified by “signature strikes” – what I would call profiling – groups of men suddenly gathering for unknown reasons – if you are a male between the ages of 17 and 30 and within a half mile of a SUSPECTED terrorist, we can blow you up – these are not strikes on known and named terrorists – just on people who a remotely operated spy cam monitored by a guy in an office thousands of miles away staring at a green screen thinks might be acting like a terrorist. In following this practice our drones have reportedly bombed weddings, funerals, town squares and even schools. There are reports of severe psychological trauma of living under a buzzing drone, wondering if and when it will drop its payload. As one villager interviewed in the report explains, “Everyone is scared all the time. When we’re sitting together to have a meeting, we’re scared there might be a strike. When you can hear the drone circling in the sky, you think it might strike you. We’re always scared.” Perhaps we should airdrop DVDs of the duck and cover video. That made me feel real safe – not. So far, only the US, the United Kingdom and Israel have launched armed drones in combat, although Australia has borrowed some from Israel for use in Afghanistan. According to evidence collected by the New America Foundation, 70 nations now have some type of drone. In an air show a year ago China surprised the US by unveiling 25 Drone models, some capable of firing weapons. At about the same time, Iran announced it had an armed drone with a range of 1,250 miles – enough to reach Tel Aviv. In 2010, U.S. company received export licenses to sell unarmed versions of the Predator drone to Saudi Arabia, Egypt, Morocco and the United Arab Emirates. And in March, the U.S. government agreed to arm Italy’s six Reaper drones. We rejected a request from Turkey to purchase armed Predator drones but the Turks aren’t upset – they’ve announced they will build their own. Israel is the world’s largest exporter of drones and drone technology. The state-owned Israeli Aerospace Industries has sold drones to Nigeria, Russia and Mexico, among others. Are you worried yet? Get this – You can buy a drone on Amazon.com. Not an armed drone – at least not yet, but perhaps the hack will be published soon – but a drone with a surveillance cam that has a range of 160 feet from the controller, which is your smart phone. It costs 300 bucks. Think about the exotic technology Mark Twain described in “Connecticut Yankee” – electricity, dynamite, automatic rifles – not all that exotic now, are they? Yet, this was all cutting edge when Twain was writing. Dynamite was patented by Alfred Nobel in 1863, just 25 years before Connecticut Yankee was published. The Gatling Gun was invented at about the same time and first used in the American Civil War. The first building didn’t have an electric lights until 1879, just 10 years before this novel was written. A bright middle school kid with access to the Internet and a credit card could probably have Hank Morgan’s exotic arsenal delivered to his mailbox next week. When will that kid – or a drug lord, or an abusive husband – have access to the armed drone technology? Experience tells me – sooner than we think. You get it, don’t you? Far from making Americans safer, drones are creating new terrorists. Why do they hate us? Because we kill and terrorize their wives and children by remote control. It’s as simple as that. What goes around comes around. There is an illusion that war can be waged with no domestic cost. This dehumanizes not just our enemies – it dehumanizes us. It fosters a callous disregard for the sanctity of human life. It destroys our souls. It leaves us surrounded, whether we expect it or not, whether we recognize it or not, “ with a solid wall of the dead – a bulwark, a breastwork of corpses.” The air becomes poisoned with putrid death gasses. Mark Twain knew what he was talking about. This is not a issue that we can escape by ducking and covering. I want to leave you on a positive note. An initiative I have been working on for several years is the establishment of a Department of Peace, a cabinet-level post on par with the Department of Defense; someone who sits at the table with the grownups and presents these issues from a peacemaking rather than a war-making perspective. The legislation was written by Representative Dennis Kucinich of Ohio in 2001. It currently has 72 supporters. A similar bill was introduced in the Senate in 2005. I’m going to be droning on about this until it’s passed or until I pass on – whichever comes first – it’s an issue that can’t be ducked and MUST be covered.